Traditional medicine advises using papaya seeds as a seasoning instead of black pepper to get rid of parasites. In fact, science knows a lot of useful properties of papaya, concerning both juicy pulp, and sharp, bitter seeds. Indeed, tropical nature generously endowed these fruits with great number of antioxidants. Health benefits of papaya are known worldwide. It is an incredibly juicy, sweet exotic fruit with a bright and attractive aroma, it grows in tropical regions of the world all year round. In shape, the fruit most closely resembles a melon with a bright orange flesh with a slightly yellowish or pinkish hue, black round papaya seeds are hidden in the core. Mainly a lot of lycopene: 2000 IU per 100 g. Other valuable substances are folic acid, potassium, calcium, chlorine, iron, phosphorus, silicon, and sodium. One serving of papaya (1 cup of diced pulp) contains approximately 55 calories, 13.7 grams of carbohydrates and 2.5 grams of dietary fiber. WHAT ARE THE BENEFITS OF PAPAYA? It is an excellent source of energy and vitamins with exotic taste and aroma. One can talk about the benefits of papaya for hours. It can be eaten for: prevention of diabetes; lowering cholesterol in the blood; prevention of gastrointestinal cancer and so on. Dietary fiber in the papaya has a unique property to bind and remove dangerous toxins from the body, reducing carcinogenic risks. Peel and pulp of fruit have wound-healing properties. They can be used in the preparation of home anti-aging and nutritious masks. Many of eye problems can be solved with this tropical fruit, which supplies the body with substances that prevent vision loss, inhibits eye aging and prevents macular degeneration of the retina. Papaya is a precious source of arginine and papain. It is known, that arginine is essential for male reproductive system. Papain is a proteolytic enzyme involved in the digestion of protein foods. Physicians consider that papaya enzyme is highly useful for heart health. Many tropical fruits are rich in folic acid (vitamin B9), and papaya is not an exception. The use of this vitamin is especially important for women during pregnancy and lactating mothers. Papaya prevents anemia, provides an influx of fresh blood to the uterus. 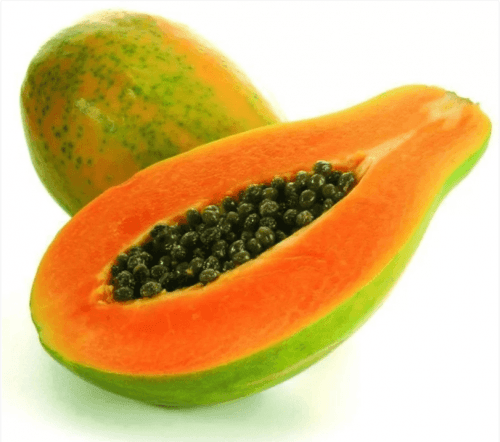 Papaya fulfils deficiency of folic acid that can cause the dangerous congenital disabilities and negatively affects the nervous system of the child. Benefits of papaya for health and weight loss make sense because of digestive enzymes, such as papain. These enzymes contribute to the early cleansing of the gastrointestinal tract from toxins, normalizing the metabolism and improving the absorption of nutritional components of food in the intestines. Physicians call papain “a digestive treasure of nature.” This substance helps in softening protein foods, including red meat. Papain is especially needed for people who have difficulty in digesting proteins. As for the hair, the papaya oil is widely known for its conditioning properties. It restores and smoothes hair structure, adds shine and makes them stronger. It also stops hair loss, accelerates their growth and nourishes the roots. Regular use of papaya, rich in plant food fibers, can normalize the digestive tract. Fruits are recommended to be included in the diet of patients suffering from gastritis and heartburn. It is also believed that the health benefits of papaya can prevent the development of colorectal cancer.